Climate activists masquerading as (yellow) journalists at the NYT, fed by Greenpeace, are attempting to create a faux-scandal revolving around Harvard-Smithsonian astrophysicist Dr. Willie Soon, due to his modest request for continuing support of his ongoing research examining the relationship between solar activity and climate. Dr. Soon's allegedly-scandalous grant request from the Charles G. Koch Charitable Foundation, obtained from a Greenpeace 2009 FOIA request, is shown in the documents below. The grant request clearly documents the scientific rationale and Dr. Soon's prior work in this field, and is conservatively titled "A Sun-Climate Coincidence?." Included with Dr. 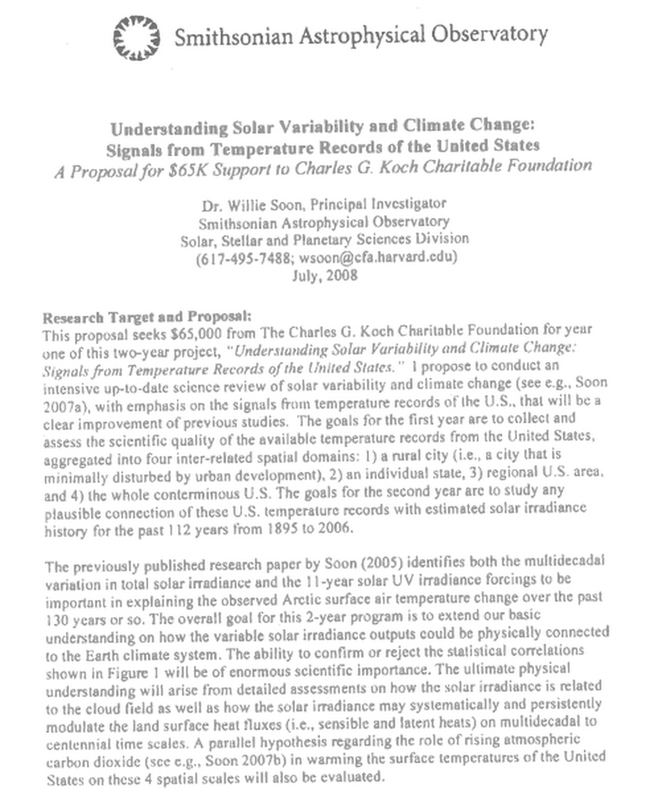 Soon's modest $65,000 grant request below are the four graphs demonstrating "a plausible connection of solar irradiance...compared with U.S. temperature records in 4 spatial domains." 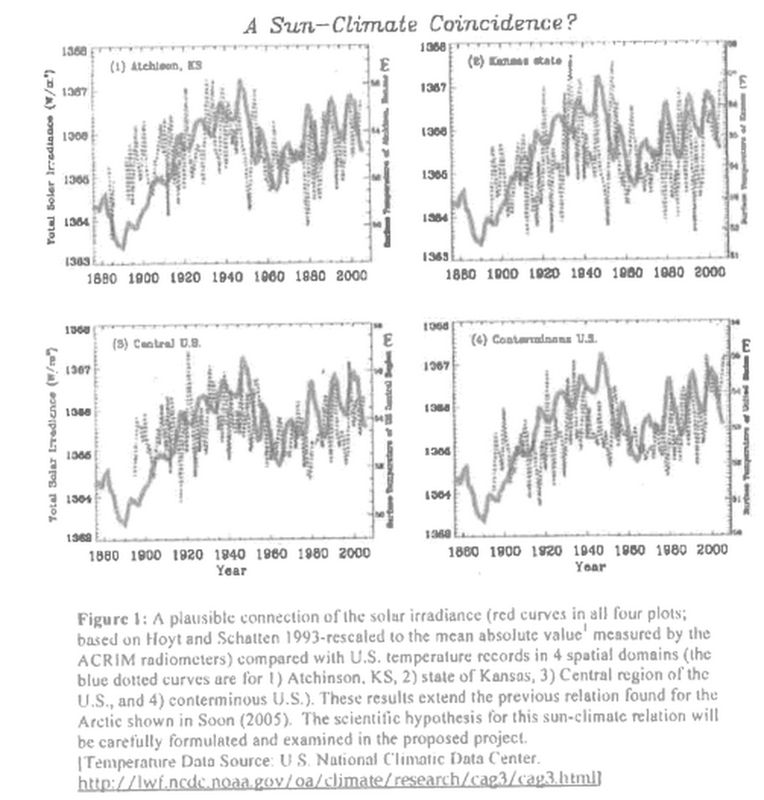 It is left to the reader to determine if any of these four spatially-disparate graphs suggest the possibility of any Sun-climate relation between solar activity and temperature over the past 130 years. The faux-scandal fabricated by Greenpeace/NYT journalist-activists is that Dr. Soon "delivered" to the oil industry what they wanted to hear, but the Greenpeace documents actually show that Dr. Soon had already completed most of the preliminary data analysis for this work prior to receiving a very modest grant from the Charles G. Koch Charitable Foundation for continued support necessary to write and publish a peer-reviewed paper describing the analysis that Dr. Soon had already performed in advance of the modest grant proposal. Dr. Soon's private grant request is based upon the conservative scientific arguments he clearly documents in his grant request below, and indeed shows most of his work for this grant had already been completed prior to his grant request for continuing support. The NYT/Greenpeace-fabricated and libelous smear attack upon an honest and honorable scientist in pursuit of the scientific truth on climate is thus demonstrated to be a faux-scandal and should backfire as an expose' of one of many examples of how Greenpeace activists, facilitated by compliant yellow journalists at the NYT/Guardian/etc, work tirelessly to stifle, smear, libel, and fabricate faux-embarrassment for any scientific inquiry daring to threaten the AGW religion.